See the From the Prime Minister’s Desk for Julia’s reflections on the earliest Patternfish years. More reflections will follow in July. Along with first and best selling patterns and snippets of information from each of the 20 first publishers, we’re launching a Patterns for Men corner based on a request from, surprise, a man! We think you’ll enjoy his observations about knitting for men as much as we did. Sometime in the fall of 2005, very shortly after my mother died, I found myself with a huge hunk of Fleece Artist Bluefaced Leicester Aran under my arm and staring at my computer screen at 3 a.m. I wanted to knit something but didn't know what. I wanted to start something right then. I was perfectly happy and prepared to pay for a pattern, and knew a number of sites where I could download some. But visiting a bunch of different sites and trying to keep track of what was available on each one separately seemed cumbersome and annoying. What we knitters needed, I thought, was a kind of online Barnes and Noble (US) or Chapters (Canada) for patterns. Where everyone who wanted to could list their patterns for sale in a bookshop kind of format. Where we could say, “I want to knit a cabled sweater for a kid about 8 years old in a DK/sportweight yarn, raglan, long sleeves, crew neck,” and see what was out there all in one place. Where we could pay and get delivery and start knitting right away, whatever the hour. It didn't exist, as far as I knew. But the more I thought about it, the better an idea it seemed. I myself would sure use it. And I couldn't be the only one, right? The next step was to try and figure out who should put this together (largely for my benefit). I knew a lot of people in the industry because I had been a yarn rep for S.R. Kertzer since 1996. Whom to bug? Someone not associated with any one particular company, because then they would have their own particular axe to grind, and I wanted an equal (but enthusiastic) presentation of a lot of different sources. Someone who could round up a bunch of patterns from these different sources quickly and without offense. Someone who knew knitting intimately and could draw up parameters for a website like this with their software staff. Someone who could see everyone's point of view: not only that of designers and publishers, but distributors and retailers too. Someone who would have the time available to devote to this project. The more I tried to think of someone else to rope into doing this, the more I couldn't. My friends and colleagues in the industry all had jobs already. My friends and colleagues outside the industry were encouraging in the abstract, but knew nothing about knitting. It began to dawn on me that I might have to be the one to do it (dammit). I did, after all, know a lot of people in the industry. I had saved hundreds of patterns over the rep years from lots of different companies. I had grown up around programmers and counted lots of them as friends. One of the very smartest ones happened to have a hole in his schedule, too, and actually wanted to do something unusual. (Thank God for Phil.) And my excellent accounting friend Shannon was freelancing and could mind the bank balances and pay people, which was rather essential. So I had motive, means, and the opportunity to come up with the opposite of a crime. We incorporated in October 2006, and went live in June 2008. And now, suddenly, it has been five years of live Patternfish. When we started planning all this, PDF's weren't even an agreed-upon delivery format-- that is, people were selling them, but there were other formats too; PDF's weren't yet an industry standard. Phil chose well. And it was Phil, too, who suggested the whole idea of a stash where people could keep access to their patterns, and through which they could receive updates/revisions if necessary; it seems this is how it's done in the programming industry. I had suggested that from time to time there could be pattern errata, and it would be wise-- should errata ever occur (snort)-- to have an easy way to deliver it. These have been five startling years for the industry. The welcome emergence of Ravelry, uniting millions of individual knitters and crocheters in their love of their craft. The surprising emergence of literally thousands of fantastically talented designers all over the world. The emergence of hand dyers as a product force. And I bow before all the new young knitters striding into the field, looking around as bare neophytes, who within a couple of years are designing and knitting pieces of a complexity that I wouldn't have dreamed of attempting with ten years' experience. Next month: Tales of the First Five Patternfish Years. The twenty original designers and publishers that committed to Patternfish were fearless. Only 5 years ago, posting knit and crochet design patterns on the internet was in its infancy. Designers and publishers were wary. Will my patterns be easily copied and stolen? Will my designs look as good on-line as they do when I produce them? How much is this going to cost? Patternfish satisfied all these queries and more. In the Patternfish catalogue you’ll find everything from designs created decades ago to designs that were created just last week. Here’s an opportunity to see the patterns that appeared early on Patternfish. The very newest patterns and designers are exciting and it is tempting to focus on them, but the older patterns are available here for very good reasons: they represent knitting history; they are valuable and beautiful; they represent the sources of every new design that gets written. For each original publisher and designer, you’ll find their very first pattern published in Patternfish, their best selling designs, and snippets of information about their history and what’s special about them. Avery’s Bear Claw Blanket, modeled on a famous quilt design, is her best selling design. All of Avery’s patterns are brilliant examples of the art of knit design and pattern writing, courtesy of her tailoring and costume design background. And happily for all of us, the needs of the knitter are never far from Avery’s thoughts. Her meticulous patterns include everything you need to know plus tips to make the project worthy of the time you spend on it. Her first pattern published is a personal favourite of the editor, especially for gift giving, the Chevron Neck Warmer. To date, Benne has only one design on Patternfish, her Silk x 2 sweater, simple and lush. Benne has a store in Port Credit, Ontario, just west of Toronto, called Linda’s Craftique, where she has taught thousands of people to knit and has a devoted following. More designs are soon to follow. If you ever visit Linda Benne, be advised that her coffee of choice is a Tim Horton's double double. Beverly Ann Finlay of Body-Grafix was one of the first young moms to design clothes for children. Her patterns are uniquely full of fun, like her first on Patternfish, My Little Lamb. Her vests and cardigans for babies and children celebrate critters beloved by little ones, lambs, teddy bears, monkeys, and butterflies; but her best selling design, Rosie, a hat and coat outfit, celebrates all things charming and deliciously girly. The very first pattern sold on Patternfish was the Diamond Poncho from Cabin Fever. The Cabin Fever sisters, aka Deb and Lynda Gemmell, are known as the no-sew sisters; Cabin Fever became one of the first publishers to use top-down construction almost exclusively. It was a natural choice for their no-sew patterns, and that construction method has defined their patterns, books, and their recent foray into e-books. The Cabin Fever sisters are a design and publishing powerhouse. They also generously support the knitting community and up-and-coming designers like Bernice Vollick, designer of the Diamond Poncho. Last Minute Baby is Cabin Fever’s best selling design, but babies aren’t the only beneficiaries of the ingenious, easy-to-knit, and wear forever garments. Check out their Full Collection, too, for no-sew Plus Size garments. The Classic Elite Yarns collection on Patternfish is already 700 strong. It's a treasure from the very first pattern, Checkerboard Family, to the very newest ones, including the soon–to-be-released Fall 2013 line. The Checkerboard Family, designed in 1992, is a wonderful example of the continuing relevance and usefulness of excellent design. Pam Allen and Betsy Perry, newly in the publishers’ drivers’ seats 5 years ago, were idea pioneers who agreed that the Classic Elite Yarns pattern history deserved to be documented. They exhibited great trust in us, for which we are grateful, and committed both their back catalogue and new seasons’ designs to PDF downloads. The best selling pattern is Elizabeth. We ran a contest for the chance to have the 10,000th design on Patternfish. Our customers voted and Elizabeth won. Here four more customer favourites. Elizabeth Fallone is a designer who likes a fresh challenge with every pattern, so you’ll see tremendous variety in her Full Collection. Her very first design on Patternfish, and the best seller, is Racer, a spectacular design that’s simple enough that men will enjoy wearing it and interesting enough that knitters will enjoy knitting it. What a treat! Fallone’s other customer favourites are just as feminine as they can be. Each design reveals her fashion background and penchant for European styles. Fallone is an excellent teacher, too. We know for a fact that some customers travel 70 miles/115 km to take a class at Fallone’s store, Eliza Knits, in Barrie, Ontario. Monster, a kids’ delight, was Gregory’s first Patternfish design and is a great example of Gregory’s love, colourwork, from stripes and intarsia, to Fair Isle, to mosaic and slipped stitch designs. The quite irresistible Dragon Paws Mitts is the best selling design. The hit tv show, Game of Thrones, should cause even more interest in these. More than a year before Patternfish launched, Julia presented the concept to Cornelia Tuttle Hamilton. She said, “Sounds like you’ve really got something there, girlie!” (something that Julia remembers happily). The elegant Hamilton excels with the most feminine of designs like this first one, Alahambra, and revels in simplicity and femininity with this customer favourite, Belinda. A bit more structurally complex are the Moriches Shawl/Vest and Roslyn. There are always surprises from Hamilton! Like many designers, Robin Hunter toiled corporately before dabbling in the knit design world and then, on retirement, taking the full fledged leap. Her first design on Patternfish, the “Fur” Trimmed Pill Box Hat, pays homage to an early interest in millinery. Hunter’s run-away best selling design is her The Prudence Crowley Vest, a very easy-to-knit textured garment that looks like a scarf but behaves like vest. Hunter has begun naming her patterns after characters in Agatha Christie books; Evelyn Howard is named for a character in Christie’s first published novel, The Mysterious Affair at Styles. Denise Powell is enthralled with costumes and historical clothing, so it just makes sense that her first design was Cleo’s Collars, entertaining toppers for simple sweaters. Toys are a favourite of hers, too, especially toys of the animal persuasion like her best selling felted Little Bear. JCA Crafts houses Reynolds, Artful Yarns, Unger, and JCA patterns. The JCA line contains patterns from a highly regarded designer familiar to many knitters, while in the other lines, you’ll see the early work of many freelance designers who became famous, like Susan Mills, Mari Lynn Patrick, Nora Gaughan, Gayle Bunn, Deborah Newton, Fiona Ellis, and Melissa Leapman. One of these designers, Kristin Nicholas, deserves a designers’ lifetime Academy Award for insisting that publishers credit individual designers on each pattern. Reynolds was devoted to classic yarns and patterns and the very first design, the Colorwork Yoked Pullover, is as classic as it gets. The designs are not without ingenuity as Norah Gaughan’s Swirl Pullover, far and away the best seller, attests. The other customer favourites are a divergent lot. Artful Yarns focused on beautiful novelty yarns and patterns that show them to best advantage. The first design, the Basket Weave Pullover, is a simple multidirectional knit that allows the yarn to shine and the best seller, Veronik Avery’s Seamless Top, is an even simpler quick knit. The yarn is everything. Here are more customer favourites. It's impossible to say too much about JCA designs. They’re timeless, fashionable, classic, and feminine with superb fit and style. The very first pattern contains three very different garments, the Openwork Cable Pullover, Striped Skimmer, and Rib and Eyelet Boatneck. Just look at the astonishing detail on each. The customer favourite design is the Ribbed Sweater. Five years ago Mags Kandis was astonished that anyone would want to buy the older designs from her publishing company, but laughed, joined Patternfish, and offered up the Innuit Gathering by Lynda Mannik as the first pattern. Kandis’s own Grandma’s Quilt, a modular pullover, soon followed and became the Mags Kandis favourite. Be sure to check out the Full Collection to see a hunky guy the way they used to be, with long, long hair. The black and white photography used for Aran and Scandinavian designs is intriguing, too. Lana Hames has a laser focus on hemp yarn for Lanaknits; her designs integrate and support it. She lives in the beautiful mountain town of Nelson, British Columbia, long a hotbed of creativity and forward thinking and a landscape that suits the enduring and beautiful qualities of hemp yarn. The first Lanaknits Patternfish design was the Lacy Little Top, perfect for summer with a lace midriff and cool, breathable, washable yarn. The best selling Hames’ pattern is the Cool Hemp Ponchette. The movie Roxanne was filmed in Nelson. It’s worth a visit. Leja is from an eastern hotbed of knit and crochet design creativity, Nova Scotia. Designers from that part of the world, like fellow Patternfish designers Lucy Neatby and Adrienne Thomas, offer forward thinking designs and are true innovators. Ilga Leja’s first pattern was Arabella, knit in a yarn from Neatby. It is a customer favourite along with the best seller, Antique Lace. Leja’s romantic, feminine, and exquisitely written designs appeal to a discerning market. Maureen Mason-Jamieson’s first design with Patternfish, the Four Corners Hat, is a brilliant use of garter stitch and Fair Isle in combination. Lots of other knitters agree; it’s a Kinver Beach Knits’ best seller. Julia likens Mason-Jamieson’s designs to the music of a great jazz player, instantly recognizable, unique, and distinctive. The Around the Corner Scarf is the favourite pattern, all square shapes in a soft and swirly scarf. Mason-Jamieson is a wonderful teacher, and she generously passes on her knowledge in all her patterns. Robin Melanson is a sought after freelance designer whose patterns appear with the best publishers like Classic Elite Yarns, Naturally, Reynolds, Nashua, and Artful Yarns. Julia met Melanson at Romni Wools, a popular knitting and fibre store in Toronto, and was starstruck. This young woman in her twenties was a huge talent, worthy of awe. Melanson’s first Patternfish design was the Hardwood Hills Gloves and she launched a new publisher, di Corvidae, last year with Vivika. It demonstrates the special talent and fondness Melanson has for cables, design details, and fit. 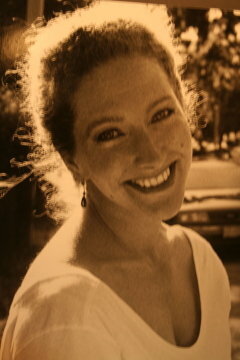 When Patternfish was in development, the highly respected designer and teacher, Sally Melville, was very encouraging. She had done many patterns for magazines and was working on one of her The Knitting Experience books when she said, out of the blue, "I might have something for you. Would Patternfish like the Cross Over Rib Top?" There was not enough room for it in the new book. Julia said, "Yes, of course!" The Cross Over Rib Top became the only completely ‘produced by Patternfish’ design. It was photographed at Julia’s house by Chancellor Shannon Shields; the pattern was converted from a word file to a PDF by Greg, Julia’s partner; it was modeled by a server from a local pub; Julia was the executive producer who put it all together and loaned the model a favourite necklace that had been made especially for Julia by Robin Melanson. That's teamwork! There was one point of contention. Sally preferred the photo that now appears on the pattern, while Julia strongly favoured another option. See it to the right. The designer, of course, prevailed. There was something magical in the arrival of the package from Naturally in New Zealand in 2007. It was the first big box of patterns to arrive, ready to be scanned and posted, more than 200. Many other boxes arrived later, from Naturally and from other publishers, but none was as meaningful. The very first Naturally design on Patternfish was the simply named Sweater With or Without Pockets and the best selling design is Sweater in 8 or 10 Ply by the talented Gitta Schrade. Danny Ouellette is known for his perfectionism; he will not release a pattern until it is perfect in his estimation and beyond perfect in ours. We are in awe. Unfortunately for us knitters, there are very few patterns that meet his exacting standards. His first, the Travelling Rib Hat, is also his best seller. A lace shawl and a cabled hat are understandably customer favourites. Adrienne Thomas understands construction and has a firm grasp on how to fold and shape knitted fabric, so no matter how puzzling her designs may look, if one of them appeals to you, trust her. You’ll be in good and careful hands. Thomas’s first design, a skirt, Penelope, is easy for all of us to grasp. Knitted skirts are all the rage and while this looks as if you could proceed patternless, don’t. The fitting details and meticulous instructions are invaluable. Thomas’s best selling design is Ana, knitted Origami as well as a hat. This British publisher, now into the second generation of family ownership, was an enthusiastic supporter from Patternfish’s beginning. The Wendy, Twilley, and Peter Pan lines, each devoted to a different style of yarn, all have classic yet contemporary patterns. The first Wendy pattern is Children’s Guernsey Sweaters, a classic designed in 1999, that no doubt will be knitted and worn for decades. The best selling patterns over the past 5 years are similarly endowed with prettiness and longevity like the Sweater with Long or Short Sleeves. Twilley’s first Patternfish design, the Crocheted Bolero and Top (tube top, in fact), has a vintage feel, but it’s very easy to imagine it being knit today and looking right. Customers' favourite pattern choices are classic with a twist like the Knitted Waistcoat with Lace Panels. Peter Pan is a legendary label in Britain for kids and it’s no surprise. They are both gorgeous and appropriate. The very first pattern was Girls’ Cardigans, with raglan sleeves, crew or v-neck, cables or lace. The number one customer favourite pattern is the Baby Layette, irresistible for the most doting of grandmothers. You won’t find Robyn Gallimore’s first Patternfish design anywhere else; Damask is a Patternfish World Exclusive. Gallimore is rightly famous for her sock designs and the most famous of all is Latvian Wedding Socks. We were very happy when Gallimore added shawls to her design repertoire. Her Eliza Shawl is very special. It’s unusual that an experienced rated pattern would be a designer’s best seller, but such is the case with Eliza. Gallimore makes full use of yarns with colour changes, very long ones in the case of Eliza, that increase the look of complexity in many of her patterns. Jane Thornley, another forward-thinking Nova Scotian, creates designs that are designs, not really patterns in the Step 1, Step 2, Step 3 sense. Thornley wants you to “forage” for yarns, take chances, free your imagination, and create wearable, knitted art under the direction of an expert. The Cowled Capelet is her first design on Patternfish and the extravagant Feather’n Fan Organic Wrap is her best seller. In May, we welcomed three new designers, a talented international gathering from Germany, Poland, and Australia. This month we’re featuring two patterns from each instead of one. It seems only fair. Melanie Berg of Mairlynd debuts with Nangou, a versatile shawl or wrap. This shawl looks like the simplest possible construction, but asymmetrical details make it interesting to knit and fabulous looking. Maevh is a sophisticated lace cowl. Hanna Maciejewska begins at Patternfish with one of her cardigans. Cardigan girls will find it hard to choose just one. If you are a cardigan girl, be sure to check Maciejewska’s Collection for more treats. The Ink Cardigan begins at the collar cable and is knit seamlessly from the top down. For sweater girls, here’s Moyen Age. Ambah O’Brien debuts with Magine, a knit from edge-to-edge shawl in a choice of two sizes that cleverly enables you to use every bit of yarn. O’Brien writes thoughtful, generous patterns. It’s clear that the knitter is never far from her thoughts. Here’s a delicate beauty, Kinta, as well, a perfect summer shawl in linen or silk. The requester, Colin, is a resident of Northern Ireland who works all over the world. I asked him to write a little something about knitting for men and he agreed. Colin demystifies knitting, and designing, for men. Read this, laugh, and learn. Knitting for Men or "The Art of Not Losing a Friend"
Apparently we men are very difficult to knit for. I have lost count of how many times a lady (or man) friend has bemoaned this fact or even cursed the day they started knitting a jumper for that now “not so special” man in their lives. But are we that difficult to knit for? Is it that much of a mystery – to knit something that a man will wear? I always thought not until I started looking for decent patterns for myself. I learned to knit over 20 years ago but only recently have I taken it up with a vengeance and boy is it hard to find something that is worth putting the effort into and wearing afterwards! I have a number of books on knitting for men that address how not to lose the man in your life due to knitting disasters, and include knits that (apparently) "men want, etc., etc." However, I would not be seen buried in most of the designs entombed in those books. So now I am thinking maybe we are that difficult to knit for. But hold on a sec, just what is the mystery here? The real mystery, for me, is this - designers claim to know what men want, outline how to avoid knitting disasters in the first chapter or two of their books, but do not take their own advice. They produce some of the most hideous things committed to page and memory. What man looks good in a canary yellow quilted looking sweater that is only two straps away from a padded jacket and accompanying cell? So here is my twopence worth on how to knit and design for a man. It is personal but nearly all of my male friends agree. Yarn – nothing that itches, snags or looks fluffy. Yes, we are babies at heart and like to feel something nice next to our skin, especially around the neck. Colour – very subjective (I am an artist and love colour, but I would not wear puce and lime green for example), simply ask the guy what colour he likes. But, and here is the big but, just because his favourite colour is seaspawn green does not mean he would want to wear a whole jumper made of it. Show him some colours knit up and let him choose. Shape and Drape – we are not all shop manikins (I am 6ft and rugby built) so what looks good on wafer thin models does not look good on me. I have very broad shoulders and most designs do not take this into consideration. Think about comfort and cut. Most of all the dreaded neck area and underarms; don’t strangle us in either region please. Texture or pattern – I am Celtic, so I like Aran knits and cablework. It’s in the blood, you could say. But don’t overdo it. Less is often better and please leave the textured pattern work for highlighted details. I came across a design for a hoodie on the internet for women. It was brilliant. It had a cabled pattern instead of ribbing and a cable trim around the hood. Very nicely done and an ideal use of patterning for my tastes. There you go, mystery solved! I have been pleasantly surprised by the designs available on Patternfish. I had almost given up looking in shops. The patterns I have chosen are simple and can be adapted, which is key for me. They are relatively plain, but classic too. I love hoodies and would love to find a cardigan hoodie. I like this hoodie pattern. It’s so hard to find one where the hood itself doesn't make you look like you belong to some unsavoury organisation! A very short line from one of my favourite of Shakespeare's plays, The Tempest, seems to me to be a fitting observation on the influence of yesterday on today's designs, and the influence of today on tomorrow's designs, "What's past is prologue."